The company’s Q4 adjusted earnings-per-share guidance topped estimates. 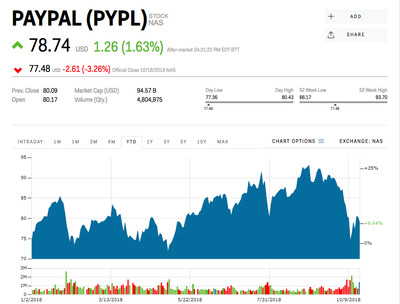 PayPal‘s third-quarter earnings beat Wall Street estimates on both the top and bottom lines, and the company raised its full-year adjusted earnings-per-share forecast. Shares were little changed in after-hours trading on Thursday. The digital-payments company earned an adjusted $US0.58 a share on revenue of $US3.68 billion, topping the $US0.54 and $US3.67 billion that analysts surveyed by Bloomberg were expecting. “PayPal had another excellent quarter,” president and CEO Dan Schulman said in the earnings release. PayPal sees fourth-quarter adjusted EPS of between $US0.65 and $US0.67 a share, ahead of the $US0.65 that was anticipated. It expects Q4 net revenue of between $US4.20 billion and $US4.28 billion – its midpoint was better than the $US4.22 billion that analysts were looking for.